Since the 1970s the following events have played an essential role in the development of European vascular surgery. The European Society of Vascular Surgery (ESVS) was founded by leading vascular surgeons R. Greenhalgh, Sir Peter Bell (UK), P. Fiorani (Italy), H. Mhyre (Norway), H. Van Urk (The Netherlands) and others. 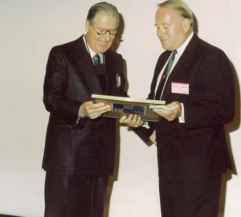 The inaugural meeting of the Society was held in May 1987, with the first President being Hans Myhre, during the International Symposium of the Charing Cross Hospital in London; it was organized by Greenhalgh, who had written the first constitution of the Society. Preceding the formation of the Society, the European Journal of Vascular Surgery was started by a European Editorial Board chaired by Greenhalgh and became the official journal of the Society  (Fig. 1.1.12). entini (Italy), J. Fernandes e Fernandes (Portugal), J. Wolfe (UK), G. Biasi (Italy), D. Bergqvist (Sweden) and others . A crucial factor in the development and evolution of the field of endovascular therapies for peripheral arterial diseases in Europe was the establishment in 1992 in Bordeaux, France, of the International Society of Endovascular Surgery. Among the eight founders members of the Society four were Europeans: P. Balas (Greece), P. Bergeron (France), J. Busques (France) and J. Bleyn (Belgium) . 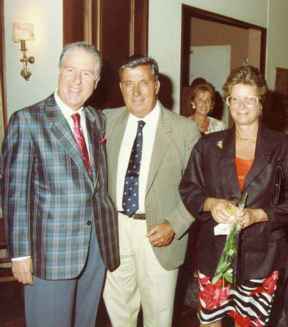 During the Congress of the European Society for Vascular Surgery (ESVS 1992), which I had organized in Athens (Fig. 1.1.14), we organized with Edwards Dietrich, from the Arizona Heart Institute, a spectacular satellite, live broadcast of endovascular procedures from his Institute to the Athens Hilton Hotel, an event that I am convinced was decisive for the decision of the European Society of Vascular Surgery and its journal to change their names to include the endovascular component . European angiology played a pivotal role in the development of world angiological disciplines, among which was vascular surgery. The promotion of European and international angiology has been achieved by the International Union of Angiology (IUA) and its journal International Angiology, which started in 1982 with P. Balas as Editor-in-Chief, and essential to this process has been the co-operation of prominent European angiologists and vascular surgeons such as F. Pratesi, A. Strano and G.
Biasi (Italy), P. Maurer (Germany), H. Boccalon, L. Castel-lani (France), D. Clement (Belgium), A. Nicolaides (UK), L. Norgren (Sweden) and others. 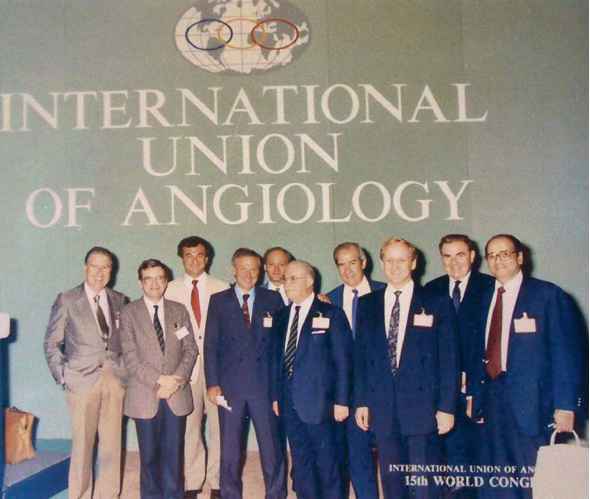 In 1988 The Mediterranean League of Angiology and Vascular Surgery (MLAVS) was established by P. Balas (Greece), A. Strano, G. Biasi (Italy), L. Castellani (France), A. Angelides (Cyprus), E. Hussein (Egypt), J. Fernandes e Fernandes (Portugal) and representatives from other European countries, under the patronage of the IUA, for the promotion of angiol-ogy in the Mediterranean countries . The contribution of the angiological schools of Fernando Martorell (Barcelona, Spain), J. Merlen (Lille, France), C. Olivier (Paris), Franco Pratesi (Florence), A. Strano (Palermo-Rome, Italy), Alfred Bollinger (Zurich) and Bent Fagrell (Stockholm) should also be emphasized. In 1959 Max Ratschow, an outstanding German angiologist in Heidelberg, published an important book Angiologie. Among Ratschows pupils were outstanding German angiologists Hans Hess and W. Schoop and the Swiss Leo Widmer (Basel). All these contributed to the development of the major field of angiology in Europe, paving the way for the development of vascular surgery. 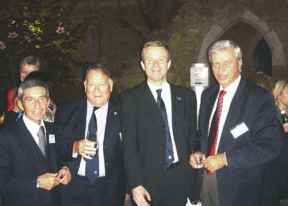 The following leading European cardiovascular surgeons George Arnulf (France), J. Kinmonth (UK), Edmon-do Malan (Italy), R. Fontaine, Jean Natali (France), J. C. Dos Santos (Portugal), Jean Van Der Stricht (Belgium) and others were the founders of The European Chapter of the International Society for Cardiovascular Surgery in 1951 and of its official journal Journal of International Cardiovascular Surgery in the 1960s, playing a crucial role in the development of cardiovascular surgery in Europe . Since the 1960s many international, European and national congresses, conferences, work-shops and other scientific activities have been organized in Europe, contributing significantly to the continuing education of trainees in angiology-vascular surgery and of the vascular surgeons. Among them were the 25 annual Charing Cross Symposia in London, the annual congresses of the ESVS in various European countries since 1988 and the international and the European congresses of the IUA . Congresses have been organized so far. Also, 14 Annual Congresses of the MLAVS have also been organized (Fig. 1.1.16). Tables 1.1.1 and 1.1.2 present various national data concerning vascular surgery in various European countries. 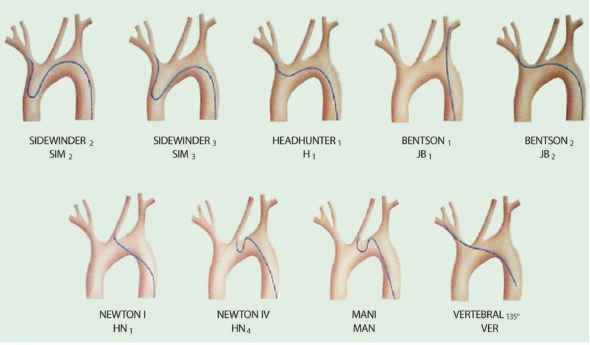 It was possible to collect these through personal communications with leading vascular surgeons and/or from publications. Some omissions are due to lack of information.